where I've been cooped up. I can still live with you. You fix and bring me food. You forget the way I've been. of this thought I'm having. It's a drum and arms waving. this meeting again with you. the Beloved has entered to tend me. unequaled Beloved, to recompense me! and faith from my neglect and unbelief and sins. after my slips He bestows victuals. surge from the heat of the day of my encounter. they would be burnt to ashes by my thoughts. would strike agitation in the army of the spirit. flames into the horizon of the sky. "Mystical Poems of Rumi 2"
and take a drink of water. She ask, "Do you love me or yourself more? Really, tell the absolute truth." He says, "There's nothing left of me. I'm like a ruby held up to the sunrise. Don't think about getting off from work. and look out to see who's there. I wonder, do you love me more, or yourself? Tell the truth, oh man of sorrows!" thee that I am full of thee from head to foot. within it – full of the sun's description, front and back. without doubt it will be in love with itself. "The Sufi Path of Love- The Spiritual Teachings of Rumi"
full of thee from head to foot. thee (who are) an ocean of honey." with the qualities of the sun. (aspects) are naught but the radiance of the sunrise. resistance to the supreme Sun. it is wholly darkness and in (the state of) death. (Hallaj) said, "I am God" and was saved. through (belief in) the doctrine of incarnation. stone may become resplendent with the qualities of the ruby. continually behold everlasting life in dying to self. nature of the ruby will be strengthened in thee. 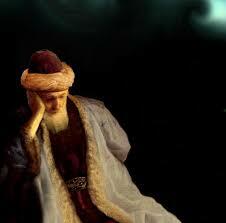 "The Mathnawi of Jalalu'ddin Rumi"
* Literally, "an ear-ring (consisting) of a ruby ring." hears the call and begins his flight. come, come back to me!" and soar to the sky. What is the rope that pulls the soul from above? What is the secret that opens the door? A baby pigeon stands on the edge of a nest all day. Then he hears a whistle, Come to me. How could he not fly toward that? in a house without doors or windows. Ask. Step off into air like a baby pigeon. Don't mind that you've been given a dirty cup." heard a whistle and a call from the unseen. "Come to Me," how should not the disciple's soul take flight? that secret way by which it drew! in this narrow cage your soul has fluttered much. wings; so the fowl of the air does when it has fallen low*. your wings against door and roof – this is the key. for by Our calling the way becomes manifest to the reason." new descends here, through time it becomes threadbare. protection, for there all is profit and increase. pure wine in this sullied cup**. "Mystical Poems of Rumi 1"
* CB pasti (low ) seems better than chusti. This sullied cup: the physical body.